My, how time flies when you’re having fun!! I cannot believe it has been so long since I posted anything on my blog!! My sincerest apologies. And to those of you who have been nagging me asking me about when I’m going to post again (and you know who you are 🙂 ) here it is! 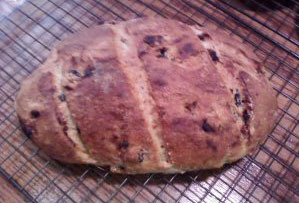 I have been very busy lately with several baking experiments. 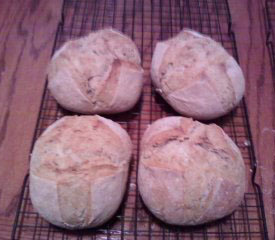 I was introduced to the concept of no-knead bread in early December. 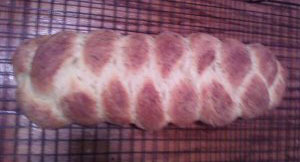 I LOVE baking bread. I’ve done it for years. So imagine my joy at finding a way to mix up a LOT of bread dough without kneading and then store it in the fridge for up to two weeks, (not that it’s ever lasted that long here), and then bake it when you want it. It does take a little advance planning, but not as much as the traditional method. I received an amazing book for Christmas, along with some pretty cool tools and stuff to make this method even easier. Thanks Mom! Here are a few of the things that I have been happily baking. There are other things that I didn’t get pictures of. Cinnamon Swirl Bread, Cinnamon Pecan Rings, Caramel Pecan Rolls, Sausage Rolls (those went so fast I didn’t have time to take a picture), Focaccia, Crackers, Calzones, Stromboli…and on and on. 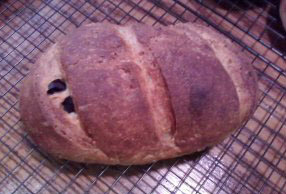 There is a web site for the book, “Artisan Bread in 5 Minutes a Day”. It’s www.breadin5.com. They also have another book called, “Healthy Bread in 5 Minutes a Day”. 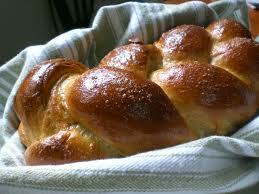 Artisan Bread uses mostly white flour, while Healthy Breasd uses mostly whole wheat flour and whole grains. I don’t have it yet, but hope to get it soon. Since the master recipe is on their website, I’m going to give it to you here, so you can start having as much fun as I have been. Well, maybe not quite as much fun. Put the dry ingredients in a large mixing bowl or 6 quart dough bucket and mix briefly. Add water and stir until well mixed. This is going to be a wet dough. When it’s mixed, cover loosely with plastic wrap, or the bucket lid, making sure that it is not too tighly covered. If you are using a bucket, make sure one corner of the lid is loose. Let that rise on the counter for at least 2 hours, and up to 5 hours. After the dough has deflated, put it in the fridge. I have found that the dough is easiest to handle after it’s been refrigerated for at least 8 hours. When you are ready to bake some bread you get your bowl or bucket out of the fridge. Sprinkle some flour over the top of the dough so it doesn’t stick to your hands, and pull off a piece about the size of a grapefruit, or 1 pound if you have a scale. Use your hands to form it into a ball, pulling the surface down and around. You may need to sprinkle some more flour on it so that it doesn’t stick to you. If you want the boule shape, then just place the ball on a pizza peel liberally sprinkled with flour or cornmeal, or on a piece of parchment paper on a pizza peel or cookie sheet. Let the dough rest, uncovered, for 40 minutes. If you want a loaf, gently press the ball into an oval about 3 inches in diameter and rest for 20 minutes. 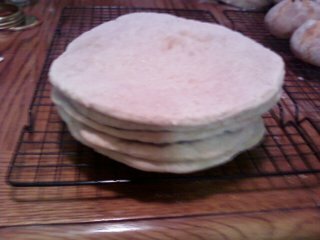 20 minutes before the dough is ready to go into the oven, place a baking stone on a rack in the center, and a pan for water on another shelf. Heat the oven to 450 degrees. 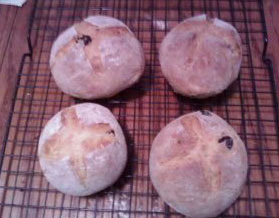 When the dough has rested, sprinkle the top with flour and slash the top so the dough can expand in the oven. 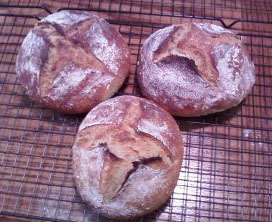 I usually make 3 diagonal slashes on a 1 lb loaf, and a cross or tic tac toe grid on the boules. Slide the dough from the peel to the baking stone, toss a cup of hot tap water in the pan and close the door quickly so the steam doesn’t escape. The steam gives you a crackly, chewy crust. Bake for 30 minutes. 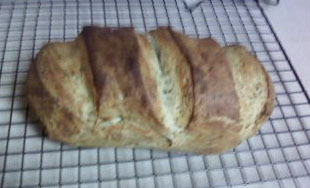 The bread is done when it is nicely browned on top and sounds hollow when you thump it on the bottom. 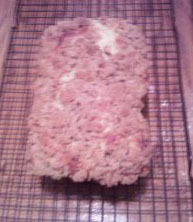 Put it on a cooling rack and cool completely before slicing. Letting it cool before you slice it gives it a better texture. If you don’t have a baking stone, not to worry. 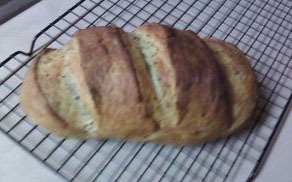 You can still get great bread by using a cookie sheet. 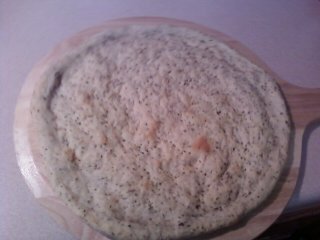 The baking stone absorbs moisture from the dough so the bottom crust is crisper. If you are using a cookie sheet, turn the bread over when there is 5 minutes left to bake, or remove it from the pan and place it on the oven rack. Won’t be exactly the same, but close. 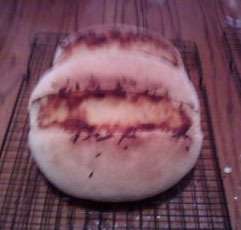 I have used this recipe for crackers, loaf pan bread, pizza crust, calzone, and what I call sandwich buns. Use your imagination! Add stuff like herbs, cheeses, etc. Sprinkle seeds on top. Most importantly, have fun! OOPS! 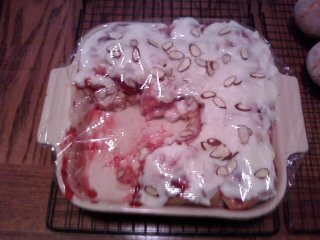 Guess I should have mentioned that you put the rest of the dough back in the fridge. It will keep for up to 2 weeks. You can also freeze it. This recipe makes enough dough for 4 1lb loaves (ish). Probably not exactly 4 lbs of dough. The recipe can be halved or doubled or even tripled if you need to.